New Windsor, Maryland (September 9, 2014) — WeWillSpeakOut.US, a national coalition to end sexual and domestic violence, is asking the Baltimore Ravens and fans to give “Purple Friday” a whole new meaning this season. We applaud the Ravens for their swift action to cut Ray Rice after the elevator video, and WeWillSpeakOut.US is asking the team to use this momentum to take further action against violence. The color of the Domestic Violence Awareness ribbon is purple — the perfect starting point for a Ravens-led #PurpleFriday campaign to raise awareness of sexual and domestic violence among Ravens Nation. WeWillSpeakOut.US, led by Maryland-based nonprofit IMA World Health, has created Facebook profile photos, downloadable and printable posters, and other materials available at www.wewillspeakout.us to get the movement started. 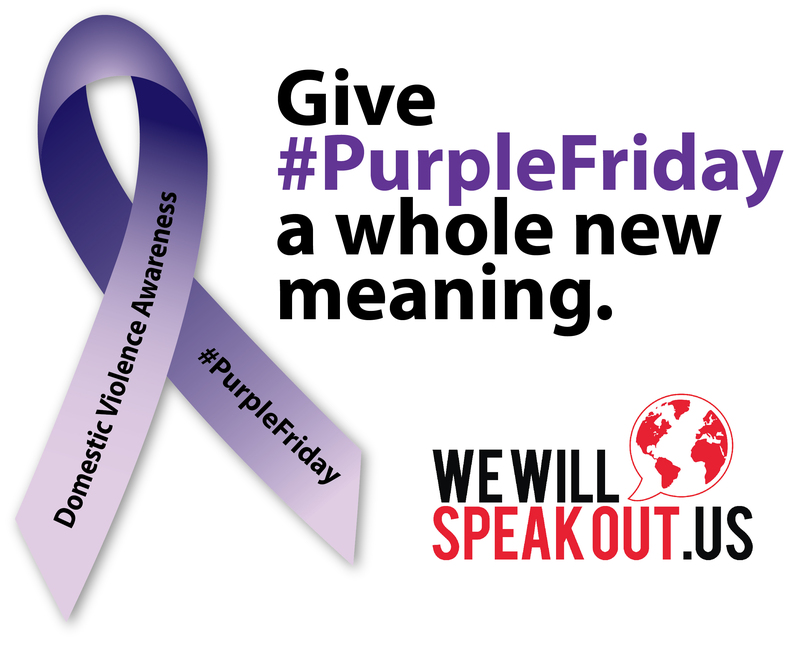 The #PurpleFriday flyers, which have hotline numbers listed for those in need of help or someone to talk to, can be posted in cubicles, store windows, and bathroom stalls throughout the region. WeWillSpeakOut.US is also asking NFL fans to post pictures of themselves on social media, holding a sign with the purple domestic violence awareness ribbon and the hashtag #nevermore — playing off the Baltimore Ravens’ namesake Edgar Allan Poe poem — to show they support the NFL’s stricter sanctions against violence and the effort to end the epidemic of violence. WeWillSpeakOut.US asks the Ravens to raise the visibility of the campaign by distributing these #nevermore signs to fans at M&T Bank Stadium at Thursday’s game. Purple ribbons, bracelets or pins (like these or these, for example) are other possible gameday awareness tools that could support the campaign. The end goal is to persuade the NFL to formally support domestic violence prevention and response efforts through a dedicated month, week or campaign similar to its support of breast cancer research. Let’s work together to ensure domestic violence is perpetuated #nevermore.